There's no doubt about it, I'm a paper 'ho. I love all sorts of papers -- the more lush and expensive, the better. The shop on Etsy is new, and still in its formative stages, but its existence has allowed me to play with paper.... in sort of a professional way. I love making patchwork with paper -- letting the colors and patterns and textures speak to me in how I arrange them (and them sew them) on the page. 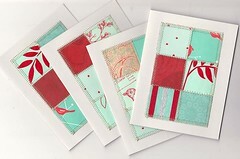 Most of my first paper items in the shop have been based on the sewing-on-paper patchwork idea. Many of the papers in the notecards pictured are from Hollander's, an amazing paper store in Kerrytown/Ann Arbor. Don't you just love the combination of red and aqua? haha...paper ho'! I'm with you girl. paper is nearly as lovely and varied as fabric. and you use it in such awesome ways! i too love red & aqua. these cards are gorgeous. I tend to buy more than I ever use. Even with origami and scrapping,I can't get ahead. It's everywhere.